Bell Hooks, Hyperion Books. Ages 4-8. This is a tribute to the joy of unconditional, parental love. Narrated by a young girl, the language in this book simply sings: "My mama calls me Girlpie. Her sweet sweet. Daddy's honey bun chocolate dew drop. 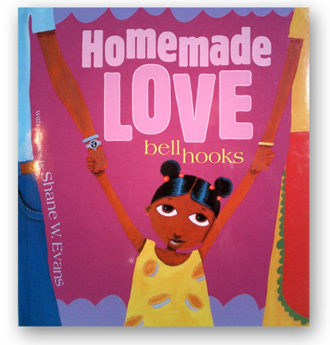 Homemade love.” Evans’s paintings, done in bright primary colors, fill up the pages so completely that readers only see the parents from the waist down for the first half of the book. Great for reading aloud.